I writed a small program for you, it is copy the start of the cartridge memory to the screen, and we can see what your machine see in the cartridge. In the WP press the F1 and Enter for load program. Make a photo what you see on your machine! Well... What can I say, I'm more than indebted for your trouble... You are really ace! Unfortunately, I thought I couldn't do it because I have no tape recorder (don't laugh; I always owned Amstrads, so I had everything I needed built-in ), but then I realized what you said, that I can connect it directly. Cool! Will try! I am also going to open it up and take a peek inside (really, are there any photos of the insides of the machine?) and try to figure if there's anything wrong by looking at it. More hard work with the cartridge because the EP64 cartridge have sticker. The EP128 cartridges are pure (cost reduction? ), these are not too rare, but the EP64 cartridge with undamaged sticker is a extremly rare! really, are there any photos of the insides of the machine? There is a lot of photos. Firstly see what detect my program in your machine and after we can thinking about the problem. Boy you're right... I didn't think about breaking the seals!!! I always open up my machines and take high-res photos of the insides, but I don't think I've ever had a machine in so good a condition and you're right, it'd be a shame... so I just looked at your photos Is the 64 cartridge really so rare? Is the 64 cartridge really so rare? Yes, specially got a standalone without machine and have a unbroken sticker. In the last four years I only got one "not working and hole at the screw" from the eBay. I'm very happy that I got it working, but it got me thinking - probably the server didn't test it!! Were all of these sold? It is good questions! We heard about some unsold stores are pulped in the 90's years in UK, but don't know it is true or not? And if true then which type and how many hw pulped? We know about 20000 Ep128 sold in Hungary, 4000 EP64 in Egypt, 3000 in Sovietunion. But don't know how many sold in UK, Germany, Spain, Netherland, France. I think that there was a very minimal amount sold in the west, as the company went under very fast and there was fierce competition. I frequent western european fora and, really, noone ever speaks about these machines... Maybe we should put this question on RetroGamer's forum, since it gathers people from all over. In the last few years I see least two EP64 machines in the UK eBay which are lower than 01000! L582 (it could be LS82) - so they didnt all use standard serial numbers !! Has anyone contacted the people who made them? Are there any interviews, do we know their names, as with other machines? How would I convert a downloaded PRG and COM file game to a WAV file to load into my real Ent64? 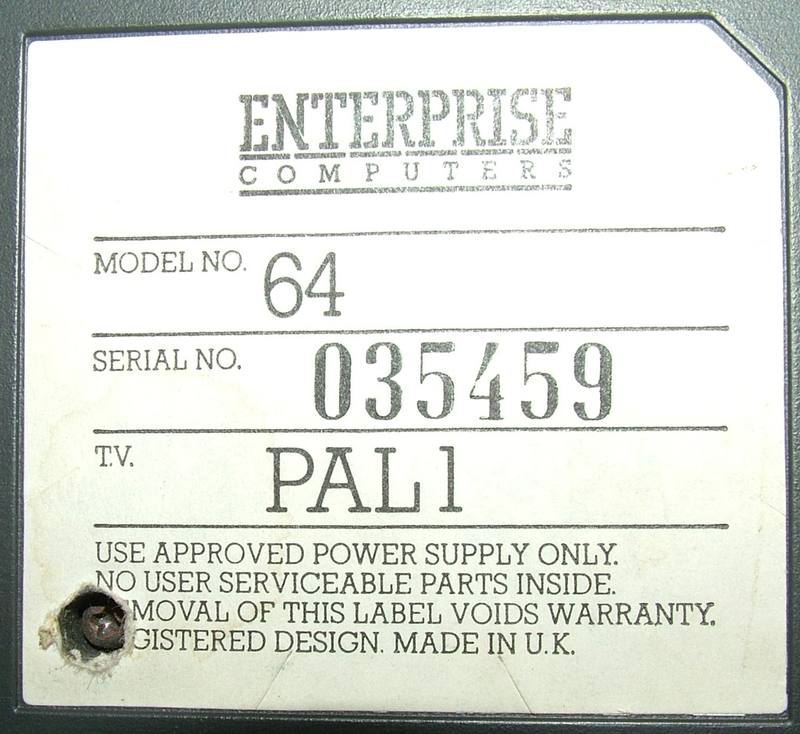 I have tried googling but sadly the words Enterprise and 64 bring up a whole load of modern computer stuff. I am assuming there is an app to do this but I cant find it anywhere.